Let's be honest -- traveling with kids isn't easy. You want to relax, but watching your children in a new environment is always a challenge. And the activities that might be fun to you and your hubby may be a bore to your little ones. You don't need to drag your mother-in-law (or your babysitter) with you to watch your kids on your next trip. Instead, pick a family resort where there is plenty to do for the whole family. You can find hundreds of family resorts but these are some of the best. With amazing activities, designated areas for kids and world class accommodations, you won't be disappointed. And of course, they all offer childcare from qualified, screened sitters and staff. Don't let the spectacular Mediterranean architecture and amazing landscaping fool you, this luxe resort is all about the families. 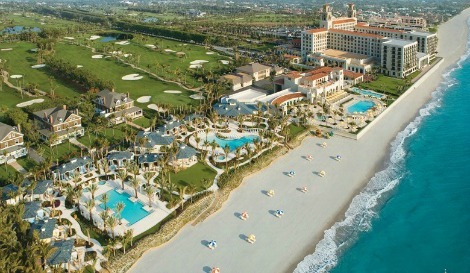 Situated on 140 acres of prime oceanfront property in Palm Beach, Florida, The Breakers has 560 rooms and 38 suites. When it comes to families, look no further than the resort's Italian restaurant. While mom and dad relax for a leisurely meal, the kids can gobble down their food, as usual. Then, your offspring can head to the attached Family Entertainment Center for over 6,000 square feet of fun. The center features arts and crafts stations, blocks, computers, train sets, tumbling mats and so much more. There's even a small movie theater. To top it off, all the activities are supervised by the resort's super cool staff. The Breakers also offers a year-round kids' camp, private babysitting, five oceanfront swimming pools, a junior golf academy and tennis academy in the summertime and just about anything else you can think of. Parents also get free use of bottle warmers, infant bathtubs, step stools, strollers and numerous other items. For families with babies and toddlers, complimentary childproofing helps your little ones stay safe. Moms will love all the amenities and extras for kids, but they shouldn't miss the spectacular spa, designer boutiques and fitness centers for themselves either. Located just south of Santa Barbara in Ojai, this retreat is a favorite among a number of celebrity parents. Moms love the 31,000 square-foot spa, dads love the championship golf course, and kids -- well, what's not to love? At the Ojai Valley Inn & Spa, they offer a year-round camp for kids ages 5 to 12 that allows children to learn about the traditions of the Chumash Indians, explore nature, listen to folklore and create amazing craft projects. Children can also fish, hike, bike and play sports. On Friday and Saturday nights, they have dive-in movies (complimentary movies and popcorn at the pool). On the property, there's also an 800-acre ranch with a few dozen horses, pony rides, an active silo and a petting farm your kids will love. The inn features a playground, a heated pool and baby pool, family golf and tennis lessons, and a whole lot more. Parents really appreciate the private babysitting services with screened sitters, as well as the free use of bicycles -- including bikes with training wheels and kids' trailers. If you are traveling to the San Diego area, consider a stay at the La Jolla Beach and Tennis Club. Home to one of California's only true private beaches, it's an amazing way to escape from the hustle and bustle. The resort boasts spectacular amenities, from the 12 championship tennis courts to the world class massage services. And for families, it can't be beat. Here you'll find a children's playground, junior tennis and swimming lessons, movie nights and other special events. Their summer Kids' Club is highly rated by visitors too. This camp-like program offers arts and crafts projects, treasure hunts, sports, movies, games and other fun activities for your little ones. With all the La Jolla Beach and Tennis Club has to offer, what you'll love most is the beach itself. The beach is groomed and stocked with equipment every morning. They provide chaise lounge chairs, beach umbrellas, tables and, of course, towels. Want something to eat or drink? Don't worry -- you don't have to leave your beach chair. Just raise a flag, place your order and it will be delivered right to you. Headed down south to Mexico? Book your reservation at Club Med Ixtapa Pacific. If you are looking for a carefree vacation, an all-inclusive trip is the way to go. At this family resort, you'll enjoy luxe accommodations, gourmet meals and plenty of family activities. Kids of all ages are welcome to take part in their various programs: Baby Club Med (up to 2 years old), Petit Club Med (from 2 to under 4 years old), Mini Club Med (from 4 to under 11 years old) and Juniors' Club Med (from 11 to under 18 years old). With each group, child care is provided and activities are plentiful. From the Baby Gym to the Children's Restaurant and Teen Spa to the Pyjamas Club, you will be amazed at all there is for your kids to see and do. Sign your little ones up for the Petite Chef Program where they can learn about cooking and nutrition. They'll also love the basketball, football, golf and tennis lessons. If you are looking for a resort where you can relax and your kids will never run out of things to do, Club Med may be exactly what you need.